A few of the artifacts that were on display came from the Ford’s Theatre collection. These included a Confederate cipher machine, a ticket to Ford’s Theatre, a key to a cell that imprisoned on of the Lincoln conspirators, and some funerary items. One of Ford’s Theatre most iconic items was also loaned to the Reagan Library for the exhibit; a blood stained pillow from the death chamber of the President. The Reagan Library’s recreation of the death chamber of Abraham Lincoln in the Petersen House. An authentic blood stained pillow from that night can be seen in a display to the left. Under this lighting, it’s hard to see the actual blood stains on the pillow. The obvious dark splotches are not blood stains but ink stains that occurred long after Lincoln’s death and before modern artifact preservation techniques. For many years, this pillow was on display at the Petersen House in Washington, D.C. Today, however, the artifact is too fragile to be on display without a climate controlled display as seen here. I’ve been told by a National Park Service employee that the pillow is so delicate that you could poke your finger straight through the pillow with ease. 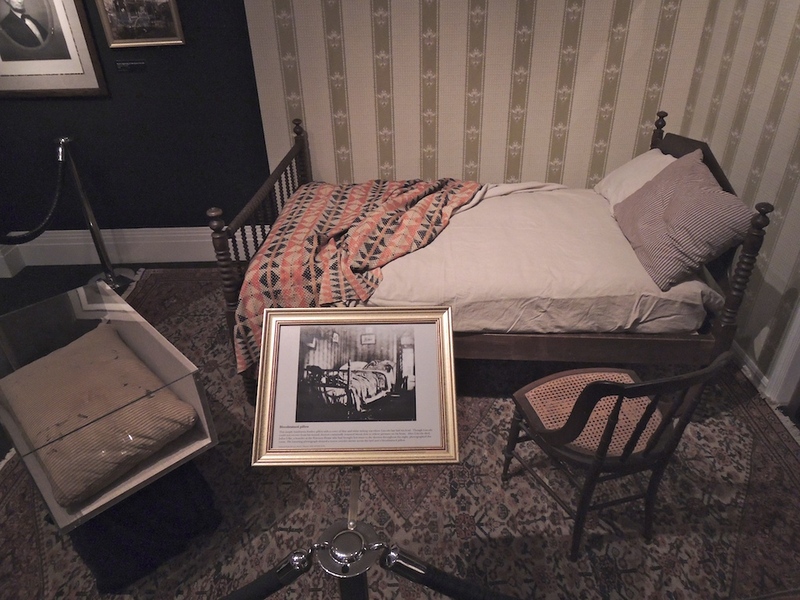 Another, less fragile, pillow from Lincoln’s deathbed is on display in the basement museum of Ford’s Theatre. A huge belated thank you to Carolyn Mitchell who visited the exhibit and sent me photographs and a copy of the exhibit catalog. You’re the best, Carolyn! Thank you Carolyn & Dave! What is in the little box below Ms. Keene’s picture? And to the left of that? A piece of Mary’s dress from April 14th? I honestly don’t know what is in the little box underneath Laura Keene. Perhaps Carolyn will remember but it was almost a year ago since she visited the exhibit. The swatch to the left of her is, indeed, a piece of Mary Lincoln’s dress.